We believe in the beauty and value of tradition. All of our silk ribbons and papers are hand dyed & hand crafted the old-fashioned way; using quality botanical ingredients and traditional methods on the finest silk & cotton. 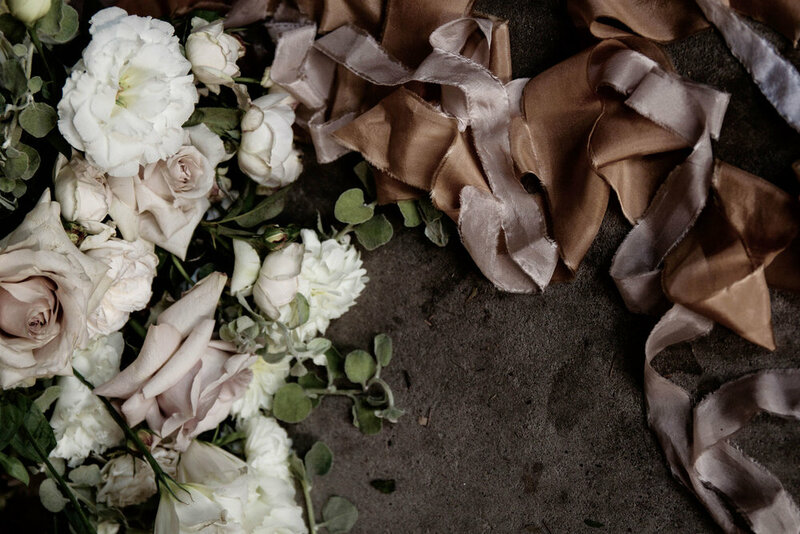 Each silk ribbon is lovingly plant dyed with ingredients that are either foraged from fallen plant matter, found in the kitchen, or purchased from herbalists and specialist dye suppliers. They are then torn into 3 metre lengths, gently frayed, pressed and rolled—all by hand. Our custom vows, love letters and verses are handwritten in calligraphy on archival, 100% cotton rag paper, creating a unique, one-of-a-kind heirloom that you will treasure for years to come. An eternal traditionalist and romantic at heart, I believe that true beauty lies in the detail and that the greatest joy can often be found in the simplest things. My affinity with flowers was inherited; my mother was a florist and both of my grandparents were avid gardeners. My mother passed on her extensive flower vocabulary, which in turn was passed on from her father. As a little girl I remember Pa would sit on an old, paint-splashed stool, meticulously pruning his bonsai collection to perfection, sculpting them into miniature pieces of art. In the language of flowers and the art of slow-craft I learnt from the best. At art school, when my peers were learning how to create vectors on gigantic blue iMacs, I was scrupulously studying the flower paintings of the 17th century Dutch masters, exploring the subtleties of oil colour palettes and experimenting with the old-world charm of handwritten type. For me, the simple pleasure of carefully crafting something by hand is imbued with a sense of wonder and intimacy that enriches my life. I hope that by keeping these age-old traditions alive, I impart a little bit of that feeling into yours.